(Deerwomon’s introduction): As anyone knows in our local area, Arkansas, Lyme disease is becoming quite prominent and so, it’s required our attention. D’Coda: We’ve got a lot of tick-borne illness here in Arkansas, it seems to be increasing and in other parts of the country too. It seems this is the topic of the day, the month, the year, the decade maybe. Lyme is the number one epidemic globally. This series will help everyone get back on their feet and help doctors and nurses because this is a toughie for them. You’ll see why, so get your doctors into the database, if you have a good nurse practitioner, get her in. And certainly, anyone who may be suffering with this, they can benefit from using the database. Ticks may not be the only way to contract Lyme but are the major vector. Here (located in the database) are topics that ought to help everyone avoid getting this in the first place. Start with the video on avoiding ticks. Next, we look at tick repellents. Powdered sulfur is another repellent, putting it on feet and legs. Deerwomon: Let me offer a way to do that, take an old sock and put the powder into it, then you just pound your boots and ankles. 4:26 – D’Coda: Ticks have been a problem in this country for a long time. In the database you’ll see a blurb that was written in the 1600’s by an explorer in the northeastern United States. By the way, Lyme was uncovered in New York and Connecticut first. That doesn’t mean that’s only where it was but it’s the beginning of our story. In the 1600’s the explorer was going on and on about how, when he walked through the woods, his clothes would be covered with ticks. We know ticks have been carrying Lyme for at least 5,000 years. Remember the ice man mummy they found awhile back? He had Lyme disease. Deerwomon: Really !! Oh, I just remember something else. Recently I had a neighbor bring me a sulfur block. Its about 16” high by about 10” wide. She put it out in the woods near my home. She said the deer will lick on it, then the ticks don’t readily attach to the deer and when they’re traveling through your area they’re not dropping as many ticks. Also, the sulfur enriches the minerals in the soil. D’Coda opens the info panel on the tick repellent section of the database to show links to recipes and text for other ways to prepare and use repellents. 6:40 – D’Coda: Recently one of the newer studies emphasized the use of Red Thyme essential oil. Not many people know about Amyris essential oil, its very effective. Making up a tick repellent like this and using it frequently. If you use one of the essential oil based tick repellents you need to keep spraying because most of them will only be effective at repelling insects for between 15 to 30 minutes. You can’t say it doesn’t work if you only sprayed once, and were out in the woods for an hour or two without spraying again. The Bourbon Geranium essential oil is a specific type that’s shown to be more effective than the other geranium essential oils. Rose geranium is also good. 7:58 – Tick Kit – D’Coda asks Deerwomon to speak about the University of Arkansas program sending out a different kind of tick kit. Deerwomon: They send you vials and a card. They are asking us to, in an area, if you find a tick, live or dead, you put it in a vial and write down the basic location of where you found it. Then you send it back to the University to assist them in doing research. I think they’re just looking for identifying the prominent diseases. I believe they’re checking for all the tick diseases. The email is uatickproject@gmail.com . It’s a free kit, they’ll mail it to you. D’Coda: The tick kit in the database is like a first aid kit. See http://www.scarymommy.com/create-tick-kit-prevent-lyme-disease/ . You can modify it according to what you’re learning through the database. 9:47 – If you are bitten – most of us were taught that you have to remove it immediately but if its been on for up to 24 hours before you find it and remove it, you’re probably safe and it probably didn’t transmit disease. Now they’re finding out that’s not necessarily true. There are some tick-borne diseases that are transmitted immediately. In Lyme, up to 10% of the ticks, themselves, had an active infection. Normally they’re immune to Lyme. If they have an active infection it can be transmitted within 15 minutes. 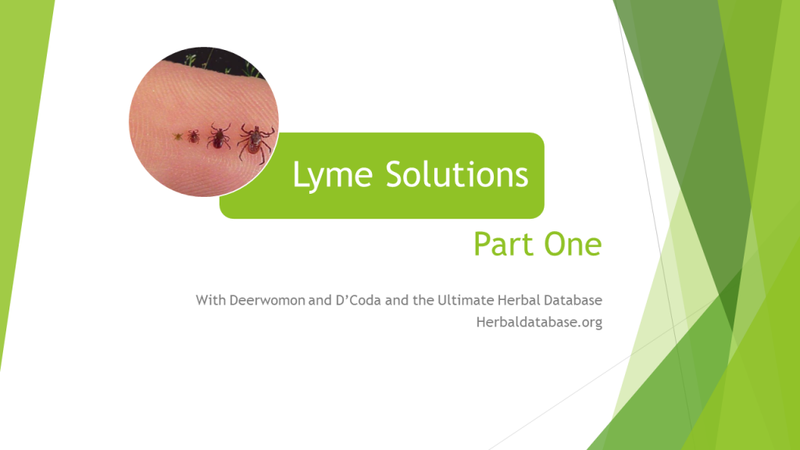 10:56 – There are some other vectors that can pass Lyme along. One of them they’re looking at now is the possibility that it can be passed along sexually. The organism, the borrelia spirochete, is related to syphilis, which is also a spirochete. They’re finding some commonalities between them and they’ve found the borrelia (the bacteria that causes Lyme) in people who have Lyme, in the sperm and vaginal secretions. There have been some cases where one partner had Lyme, the other partner didn’t and had not been exposed to any ticks, yet later on developed Lyme disease. An aborovirus is a virus that can be transmitted by insects, particularly by ticks. D’Coda points out another topic in the database showing how to correctly remove a tick. 12:49 – We know that Lyme Borreliosis is a disease that’s been with us for an estimate of at least 5,000 years. It was found in that ice-man mummy. Other studies show its been in humans for a long time. If you were diagnosed with Lyme disease, consider yourself one of the fortunate ones. The reason I say that is because first of all, it’s essentially a clinical diagnosis, meaning, they can’t rely on lab tests because there aren’t any really accurate lab tests. 13:42 – The Western Blot is the lab test they usually use. It only picks up 50% of Lyme cases. A reason for that is when they developed the test, they used two borrelia species extracted directly from the tick. That’s what they would test for, those two species of borrelia that came directly out of the tick. However, we’re discovering that this bug is a chameleon. As soon as it enters the human body, it starts to change its antigens, so it can evade the immune system. It also changes into different variants. Initially it enters as one type of spirochete, then it changes. This is the largest bacteria we know of. It contains 26 of 27 different chromosomes, all designed to evade the immune system, partly by changing its gene expression. The problem with the Western Blot and a number of other tests, the ELISA isn’t as good as the Western Blot, is it can’t detect all of these different forms. So, if you do get a Lyme diagnosis, you’re very lucky that it was detected because Lyme is called “the great imitator”, it masquerades as other diseases. People who are diagnosed with conditions like Fibromyalgia, Lupus, Lou Gehrig’s Disease, Bell’s Palsy, Chronic Fatigue Syndrome, Multiple Sclerosis, those can actually be Lyme. Its masquerading creating the same kinds of symptoms and effects in the body as these other conditions. 16:50 – D’Coda opens the information panel on the heading “Lyme Disease” to show links and text. If you think you have it, or know you have it, it’s well worth your time learning all you can because the chances are your doctor has not had an adequate education in Lyme. In fact, there’s a branch of study in medicine specifically on Lyme disease that doctor’s have to take in order to be considered a “Lyme Literate Doctor”. In the database you can locate Lyme Literate Doctors. It they’re not Lyme literate they’re probably going to misdiagnose, it’s a clinical diagnosis meaning that the doctor has to know what to look for. If he has a patient with Fibromyalgia, for example, that isn’t improving, he has to know it could be Lyme. 18:08 – In the database we have a lot of information about diagnosis. Some of it is oriented towards doctors who are subscribers to the database.